I am in full "Getting Ready for Kindergarten" mode with the Littlest Diva. I am spending time reviewing the basics with her so that she is feeling confident and ready to learn when school begins in a mere 3 weeks (where did summer go anyway?). The other day I decided to do some quick number recognition review. I subscribe to the thinking that there is no better way to learn than through play so I turned the review into a game. Being summer (and incredibly hot and humid here in FL) I wanted to incorporate water to entice her to play. When she came to me with our bag of balloons asking me to blow one up for her, I was inspired. This can be used in many different ways - we will surely be doing this with sight words very soon. I kept this very simple. I went outside and drew a large target/circle with 4 rings using various chalk colors. Then I randomly added 2 digit numbers in each ring. The middle target had a 3 digit number (a challenge!). 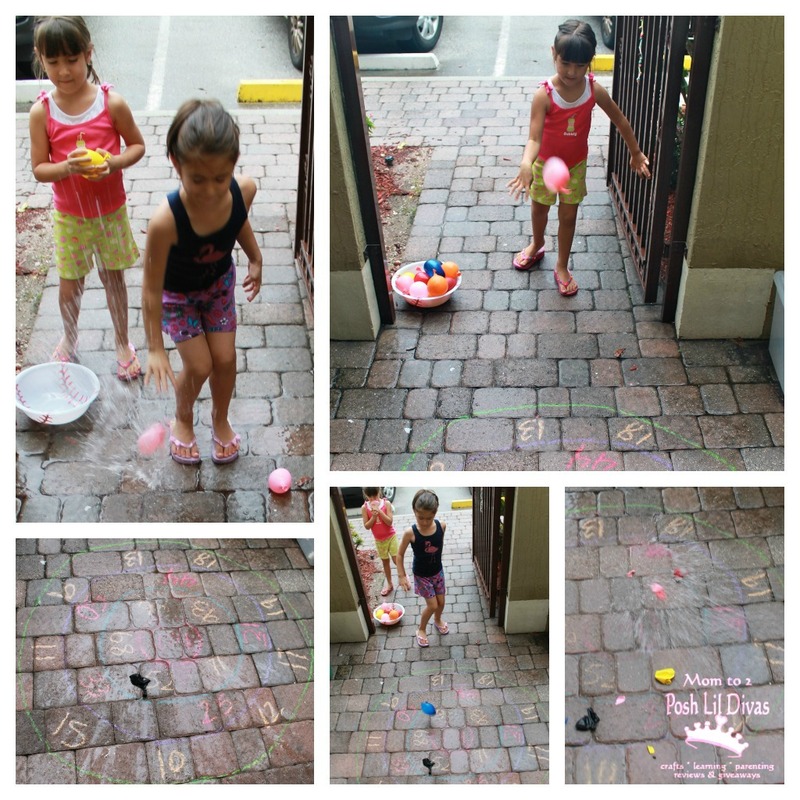 To play, each Lil Diva armed themselves with a water balloon and threw it at the target. They had to read whichever number it landed on. Our game ended when the numbers had been washed away. It was quick & easy to set up, fun (and wet) for the girls to play and they didn't even realize they were working on basic math skills. I love when I can sneak in learning into fun time, don't you? How else would you use this game? Looking for more fun math ideas? Check our Preschool Math section or our Math Fun board on Pinterest - it's chock full of fab ideas. *Note*- Children should always be supervised when playing with water balloons. I LOVE this idea! I'm sure it will appeal greatly to my preschool sidekick (after all, how often are you allowed, even encouraged, to throw and smash thing?!). yes, my girls got such a kick out of throwing the balloons and getting all wet! enjoy & thanks for stopping by. I did something very similar with my son. I LOVE him learning something when he doesn't even realize it! 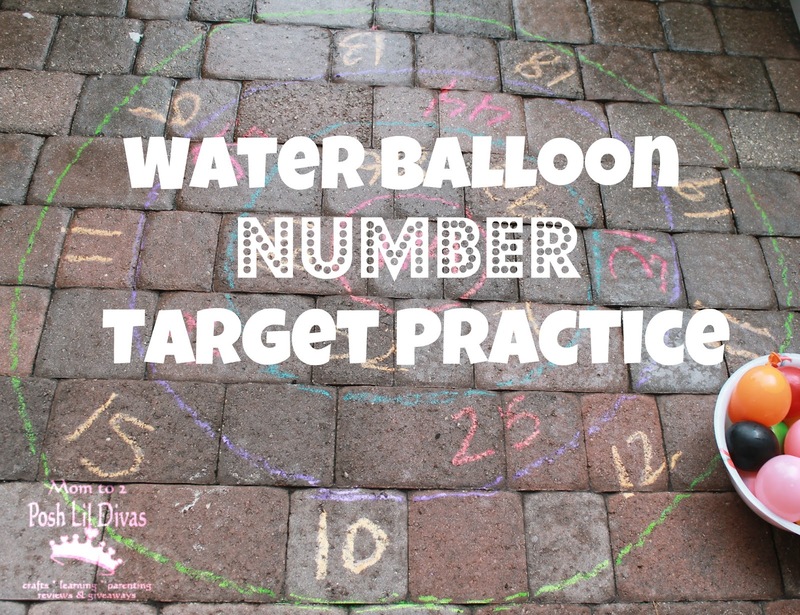 What a fun idea - I need to get hold of some water balloons to try this over the summer - we've still got 5 weeks until preschool starts. Cerys, 5 weeks still? I am jealous! School starts in less than 3 weeks for us. I am mentally in back to school mode when all I want to do is enjoy the rest of our summer. I can't help myself! What a COOL way to review numbers! Mine is heading to kinder too, and this would be useful for us too. Rebekah are you ready for kindergarten? I can't believe my baby is going to school full time - I am having serious adjustment issues. She on the other hand is totally ready for school and looking forward to it. Wishing you and your cutie the best of luck as summer winds down and back to school rolls around. Great idea! 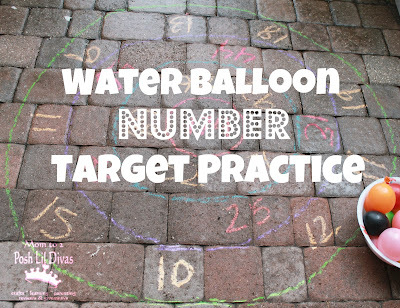 My little one is very interested in learning letters and numbers... and she gets to toss water balloons! Fantastic! I bet you could do it with coin/paper money recognition if you used laminated bills and coins. I bet synonyms and antonyms would be awesome too! Thanks so much for sharing!